What is the 2018 District of Columbia Minimum Wage? The 2019 District of Columbia Minimum Wage is $11.50 per hour. The District of Columbia Minimum Wage is currently $11.50 per hour. The District of Columbia Minimum Wage is greater than the Federal Minimum Wage of $7.25 per hour, so employees in District of Columbia are entitled to the higher minimum wage of $11.50 per hour. Please Note: Eighteen states have raised their minimum wage as of January 1, 2018. Make sure you know any new District of Columbia labor laws. What is the District of Columbia Minimum Wage? The District of Columbia Minimum Wage is the lowest hourly wage that an employee working in District of Columbia can legally be paid. Both District of Columbia and the federal government have set a legal minimum wage - District of Columbia's is $11.50 per hour, while the federal minimum wage is $7.25 per hour. Federal law states that the applicable minimum wage is whichever minimum wage is higher. Certain occupations and employees are exempt from District of Columbia and Federal Minimum Wage regulations, including tipped workers, students in high school and college, and certain disabled workers (with a certificate from the District of Columbia	Department of Labor). Read more about exceptions from District of Columbia	minimum wage law . How much do District of Columbia Minimum Wage employees earn? Full time minimum wage workers in District of Columbia earn a total of $460.00 per week and approximately $23,920.00 per year (based on a 8 hour days and a 260-day work year) before taxes. The federal poverty threshold for a household of two is $14,570 per year. All District of Columbia employees working over 40 hours in a work week are entitled an overtime wage of at least 1.5 times their regular hourly pay rate - therefore, the overtime minimum wage in DC is $17.25 per hour. In addition, District of Columbia law requires all employees working over 8 hours in a single day to be paid overtime. Some workers or employers are exempt from overtime law including independant contractors, seasonal workers, and some farm workers. Contact the District of Columbia Department of Labor for details. If your employer is paying you less then the District of Columbia minimum wage, if you believe you are owed back wages for unpaid overtime, or your employer is otherwise violating District of Columbia or Federal labor law, the District of Columbia Department of Labor is there to help you. Call your local office of the District of Columbia Department of Labor, and and they will advocate on your behalf to ensure your employer becomes compliant and you receive any necessary backwages or compensation. Be sure to have recent paystubs, timesheets, employment contracts, and other important documents on hand when you call. The Fair Labor Standards Act (FLSA) requires all employers in District of Columbia to display the	2019 District of Columbia Minimum Wage poster along with additional labor law compliance posters in a conspicuous place for all employees to read, such as a hallway or breakroom. Failure to display all required labor law posters can result in a fine. 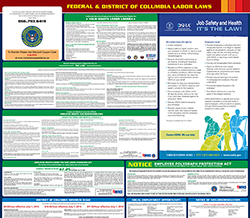 This professional District of Columbia labor law poster includes all of the posters needed to satisfy both District of Columbia and Federal minimum wage and labor law regulations. Free labor law posters: Basic PDF copies of the Federal Minimum Wage posters can be downloaded from the Department of Labor with the links provided below. Please note that additional posters are also required by Federal and District of Columbia law. A professional poster including all required postings can be purchased through the link provided above. With the current state of the economy, a large amount of the new jobs being created in District of Columbia are entry-level, minimum wage positions. Full time, part time, and seasonal minimum wage jobs in District of Columbia can be found through local employment listings or a local job search site. You can use the search box below to find current job listings in your area.